CAPE CANAVERAL, Florida - NASA's Cassini spacecraft captured one of its highest resolution views of the pockmarked surface of Saturn's moon Prometheus which measures 53 miles across (86 kilometers) during a moderately close flyby on Sunday. 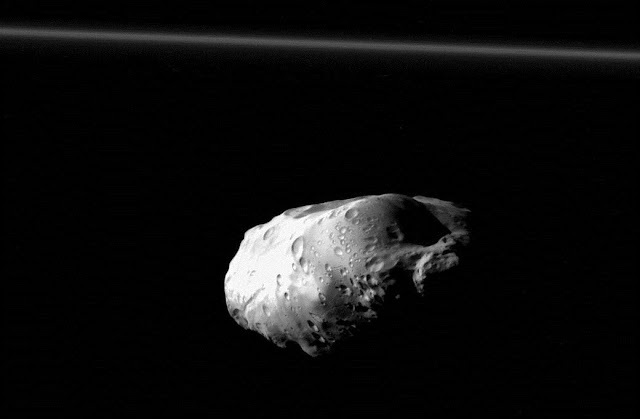 This view looks towards the anti-Saturn side of Prometheus. North on Prometheus is up. The image was taken in visible light with the Cassini spacecraft narrow-angle camera. The view was acquired at a distance of approximately 23,000 miles (37,000 kilometers) from Prometheus and at a Sun-Prometheus-spacecraft, or phase, angle of 87 degrees. Prometheus orbits Saturn just interior to the narrow F ring, which is seen at the top of the image. Saturn has a total of 53 named moons. An additional 9 objects orbiting around Saturn have not yet been classified and named as moons. Cassini was launched from Cape Canaveral Air Force Station in Florida on October 15, 1997.